Following the release of the trailer, Dan Aykroyd and Enrie Hudson react to the news of a new Ghostbusters movie happening from Jason Reitman, the son of the original director. Dan Aykroyd took to Twitter: "If you need a tune-up, you know who to call #GB20." Likewise, Ernie Hudson tweeted his approval, "Bigger than a 100-ft marshmallow man! @dan_aykroyd: If you need a tune-up, u know who 2 call #GB20." 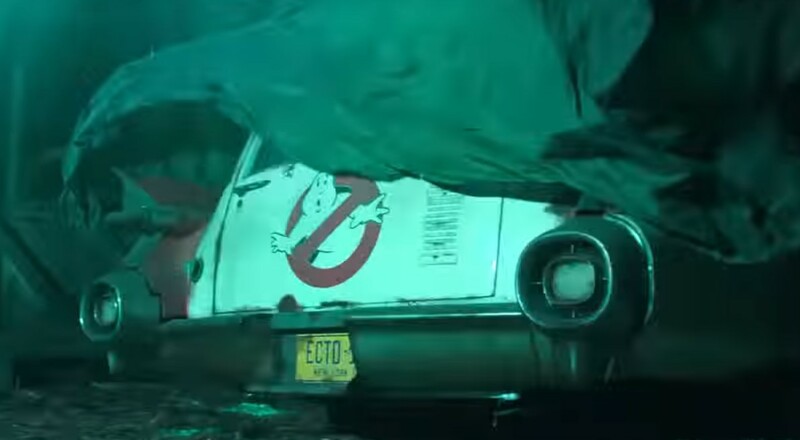 The teaser shows Ecto-1 partially uncovered in an old barn with the familiar Ghostbusters music score playing. A proton pack is turned on with "2020" shown as the release date in green ectoplasm (Slimer?) with purple proton pack energy going through the text. The new Ghostbusters movie is not a reboot as it is set within the same universe as the '80s original movies (similar to what they did with Dwayne Johnson's Jumanji). As everything is in its early stages, it is unknown if the original actors, which includes Bill Murray, will be back (Harold Ramis passed in 2014), but some sort of cameo or appearance seems likely. Dan Aykroyd will also probably be involved as an executive producer. The new Ghostbusters follows the failed reboot by Sony using the all-female cast, which fans loathed. This time, Sony seems to be making things right as instead of replacing the much-loved original cast, they are adding to it. Again, think of what they recently did with Dwayne Johnson's Jumanji: Welcome to the Jungle, which was a huge hit Christmas 2017 (even outpacing Star Wars). Jumanji featured new characters, actors and a story, but it was set within the same Jumanji universe as the Robin Williams movie and respected everything that came before (there was even a nod to the original in Johnson's movie); so we can probably expect something similar for the Jason Reitman Ghostbusters. Regarding Jason Reitman, Ghostbusters seems to be in good hands with him. Not only is he well-experienced (Oscar nominee), he grew up with Ghostbusters and is a huge fan. "I’ve always thought of myself as the first Ghostbusters fan, when I was a 6-year-old visiting the set. I wanted to make a movie for all the other fans,” Reitman tells EW.com. “This is the next chapter in the original franchise. It is not a reboot. What happened in the ‘80s happened in the ‘80s, and this is set in the present day. This is very early, and I want the film to unwrap like a present. We have a lot of wonderful surprises and new characters for the audience to meet." Jason's father, original director Ivan Reitman, is also involved as a producer and gives his approval.